Eliopsomo: Greek Olive Bread. Photo © N. Gaifyllia, licensed to About.com, Inc.
Olives and bread... what could be a more basic combination in a Greek bread? 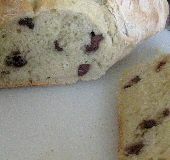 This recipe for Greek olive bread can be made with black or green Greek olives. In a large bowl, combine flour, salt, sugar, and oil and mix. Add water/yeast mixture and knead on a lightly floured surface until the dough is smooth and doesn't stick to hands (about 20 minutes). Form dough into a large round loaf and place on a floured pan or cookie sheet in a warm place, cover with a light kitchen towel and allow to rise for 40 minutes. Punch down the dough, add olives, and knead until the olives are distributed throughout the dough. Preheat oven to 395° (200°C). Divide dough into 4 equal parts and form into loaf shapes. Score the top of each loaf in 3 or 4 places, place on a floured baking pan (well spaced out) in ​a warm place, lightly covered, and allow to rise for about 20 minutes. Yield: 4 loaves of Greek olive bread.